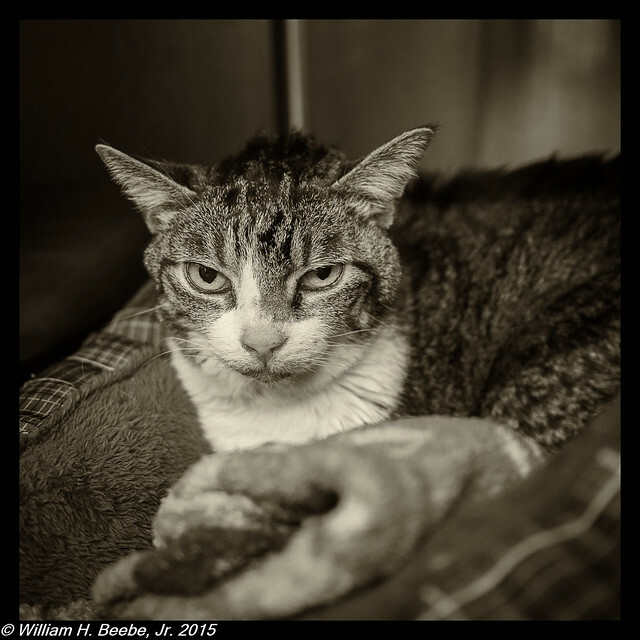 I thought that by today I might have good news about Lucy the ASL Cat. She came home from the vet’s this past Monday and as usual refused to eat. So I stopped by a local Publix grocery on the way home from work and picked up a can of Goya brand mackerel. Once in a food dish she tore into it like she was famished (and point of fact she was). She ate a large helping at every meal until yesterday, when she started to slide back into lethargy and not eating. So Judy took her back to the vet’s this afternoon. And while she was there Lucy had another throwing-up session, except this time it was clear with a little bile in it. All the fish she’d eaten was apparently farther down her GI tract. I drove straight from the office after leaving work a bit early to the vet’s. I met my wife there and then with Lucy, and finally the vet. 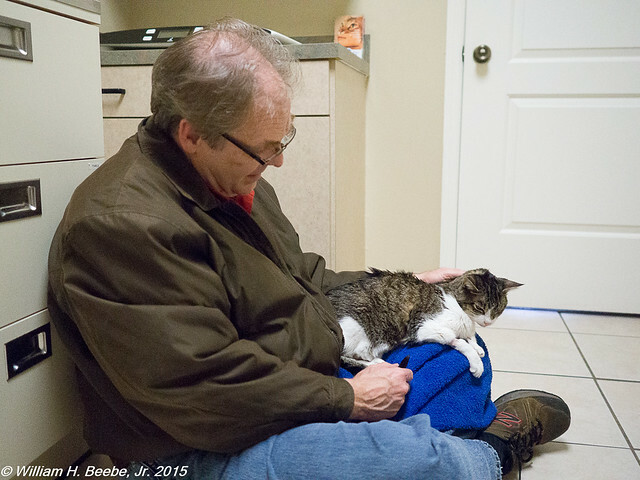 While my wife and I were alone in the visitation room waiting for the vet, Lucy was brought back in to us. At first she was quiet, but then she began to move around the room, checking things out. She seemed to rally quite a bit and was soon walking and jumped up on the bench, moving from one end of the room to the other, and even rolling over playfully on the floor. She was her regular kittenish self (she’s always been the most playful of the three cats). While she was active I took a number of photos and posted them on my Flickr stream. I intended to post them here, but instead I picked these two photos of Lucy to show her at her best. They were taken by me as soon as I got home from our wedding anniversary cruise back in September 2014. I’ll always have all the photos of Lucy, and I’ll cherish them all. My only regret is that I never seemed to have taken enough of her. But that doesn’t mean I can’t remember all the other little Lucy incidents and stories. You can see just how cute and playful she could be in the second photo. And for whatever reason, the light coming into the room that day seemed to fill the air around her with a glowing energy. Almost angelic. 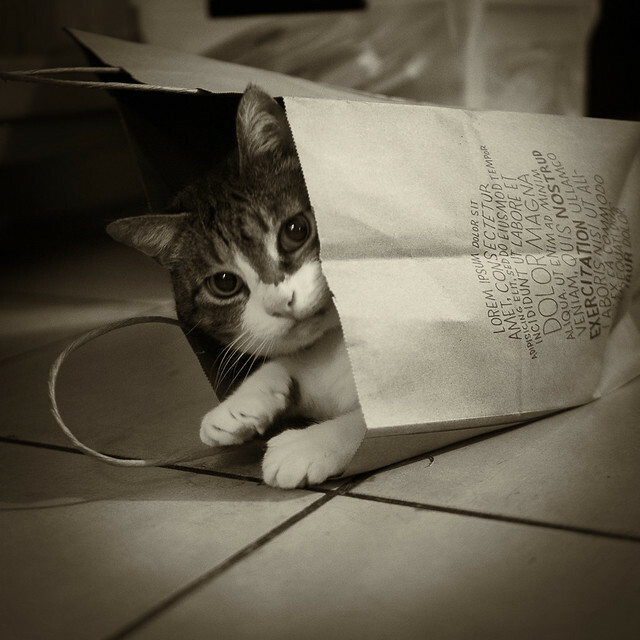 Lucy was always claiming any box or bag on the floor as her own. She’d jump in and roll around to make some noise, then poke her head out to see if I was paying attention. Then she’d give me those big round cat eyes for a moment and then shoot out like she was jet propelled. None of the other cats would do that except Lucy. And every time she did it I’d laugh. I think that’s what she wanted to hear, my laughter. I may very well be heading into the ultimate end state for Lucy, where I have to put her to sleep. I want to give her every chance to come out of this and live with us a few more years. She rallied well today and so I gave permission to the vet to have her scoped next Monday just to see what might be wrong and if it’s fixable. But I have to be prepared for the worst. Animals don’t live forever, any more than humans do. I never thought I’d be this attached to a cat the way I’m attached to Lucy. I have no idea how old she really is. She became our third household cat in 2008 during a very hot August. Our next door neighbors had left for a vacation and asked if I’d feed and water two strays that had appeared on their doorstep. One of them was Lucy. So every morning and evening I’d go over with food and water for both. I wasn’t trying to be sneaky, and Lucy wasn’t dumb, so she started to follow me back to my house. I started to feed and water her at my front door. Then one day, not long after she started to follow me home, I opened the front door and stared down at Lucy. She stared back up, gave me a perfunctory meow, and walked in the front door to live with us. And here, I believe, lies a small problem with how I relate to Lucy. In spite of her kittenish behaviors and her thin body when she first arrived, Lucy may be a lot older than I think. She was already fixed and had a flea collar on her. My theory about Lucy is that she was left behind with one of the many houses in my neighborhood that got hit with foreclosure. When the owners left one of the houses behind, they left Lucy as well. Lucy could very well be a senior cat; I just don’t know. Regardless she’s had seven wonderful years in this household, and I’ve been blessed with seven wonderful years of her presence. Once in the front door I gave her another dish of water and some of the cat food we fed our other two cats. And that started a seven year love affair between a cat and a human. Lucy really did love me. She’d come up in my lap, no matter where I sat, and purr like a motorboat. I’d give her rubs and she’d purr even louder. After a time she’d leave, check out the house (we laughingly called her out guard cat) and come back for another rub session. As our “relationship” progressed she’d meet me at the garage door when I’d come home. 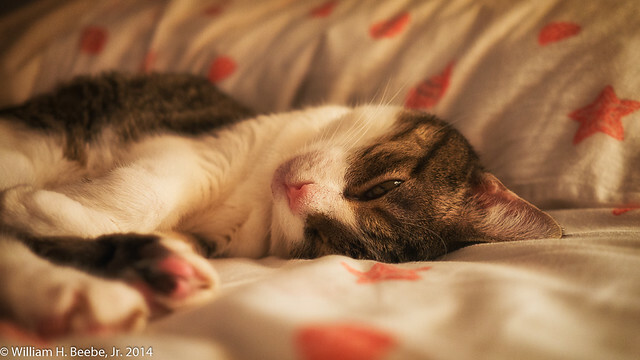 At night, when it was proper time for bed, she’d come get me, purring all the while, and herd me back to bed. Then she’d jump up on top of me, walk up my chest, then drop down sphinx-like to stare into my face. That was my cue to give her more head and ear rubs. Finally I’d gently move her off, turn off the bedside lamp, and slowly go to sleep. Lucy would curl up beside me and go to sleep herself. 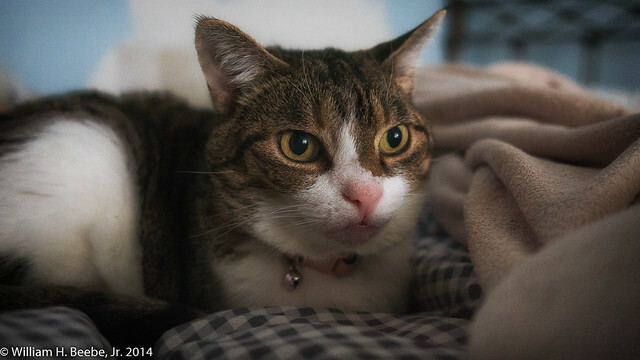 In the morning my personal purring alarm clock would wake me, and the day would start anew. The house is empty right now and lonely without her, in spite of having my wife, the two Labs, and the other cats with me. Lucy was my cat and she loved me with a fierceness I’ve only seen in one other animal, my long-since deceased black Lab Katie. And I have to now admit, I love that little cat back just a fiercely. I didn’t realize until I started to write this post just what period in my life Lucy was around for. 2008, the year Lucy arrived, was the year I changed jobs for the company that would eventually lay me off in 2013. It was the same year my wife had to have her artificial knee replaced with a second operation because they’d botched the first operation. 2011 was the year I blew out my left knee and the start of a year of constant and increasing pain. 2012 was the year I got my left knee partially replaced, and 2013 was the year I was laid off. And Lucy was there to witness it all, and a lot more. When I had my knee surgery Lucy was my constant companion while I was down and out on my back. Lucy was especially attentive as only a cat can be. When I started to travel for weeks at a time, loyal Lucy was always there to greet me to give me ankle rubs and purr a hearty welcome. Only Ruby the Lab was as attentive (and she still is). I’m going to show this last photo, because it’s of Lucy in the vet’s office. She’d walked over to me and settled on my left leg, just like old times. I lost it badly at that point, and I’m still losing it when I see this photo. My wife took it for me. And for those who think I live under a rock, I’m aware of Leonard Nimoy’s passing. A child of the 60’s, I was fortunate to see The Original Series when it was first broadcast. I was mesmerized by the Vulcan as well as the series. 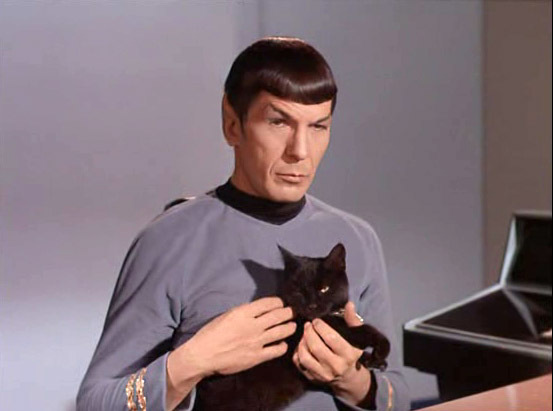 To drive home Vulcan superiority, here’s a photo of Spock with a cat. This is a scene from the last episode of season 2, “Assignment: Earth.” It was the last TOS series I remember before the horrible third season started with “Spock’s Brain.” After “Spock’s Brain” I never watched another episode of TOS until it hit re-runs. I’ll always have the first two seasons, especially episodes like this one. With a Cat. Lucy is at the vets this weekend. She’s been there since late this past Thursday, on an IV solution to get her strength back up. Before she was taken to the vets by my wife, she’d stopped eating nearly everything I could think of to put in front of her, and wasn’t drinking much at all. She’d been ill with something since this past November when she started vomiting about once/week. We took her to the vets, and tried out some anti-vomiting medicine, which seemed to help a bit. But about a week ago she took a turn for the worse. Although we have two other cats and the two Labs, Lucy really is mine. The house is very empty without her. There’s no Lucy to run up into my lap in the evenings when I’m sitting in my chair. No Lucy to come out late at night and herd me back to bed. No Lucy to sleep at my feet, no Lucy to walk on my shoulders and purr in my face in the mornings. I’ve checked on her every day including today, and she looks and acts a lot better than she did this past Thursday. She comes over and talks to me when I visit. I think the hardest thing for me to accept out of all this is how I almost killed her with kindness, thinking I could figure out what was wrong with her. Owning a cat doesn’t make you a cat expert, no matter how long you’ve owned here, and no matter what you’ve read over time. She’s been in the household since 2008. That’s seven years. She’s had a good life with good food, toys, places to play indoors, and regular vet visits. Hopefully she’ll be around another seven years. If not, well, I have a lot of memories, and there are no shortage of little guys and gals who need rescuing. But Lucy will always have a special place. In 2008 she picked me. I didn’t pick her. And she’s been a loyal little thing ever since.